I have a vague memory of the Saturday Evening Post popping up on the coffee table when I was quite young, sort of like Life Magazine periodically resurrects in supermarket checkout aisles these days. I suppose a century ago when magazines were the hot new media, maybe The New Yorker, Punch, or American Mercury would have been the thing, though I have jumbled some dates there. When I got a bit older and could tear myself away from the comic book racks, I was amazed by the profusion of magazines. Many were stuffy or boring or glorified newspapers. Let’s face it, they had to compete with Mad Magazine if they were going to garner my attention. National Lampoon was asking too much. Cream and the other rock rags walked a fine line- they looked like the teenybopper drivel, but sometimes had decent writing. They were brief preparation for that giant magazine printed on cheap paper. 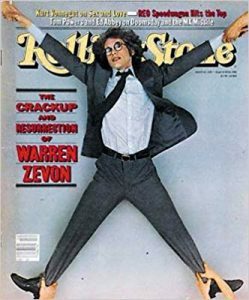 Remember how Rolling Stone always seemed to sit by itself, because it was the wrong size? Also, you weren’t going to read their magazine surreptitiously. The dam burst when my oldest brother moved to California and started shipping care packages home. Through the goodness of his heart, he crammed all the magazines that came his way into a giant envelope, after he was finished with them. There was a lot Billboard, as I recall. Nothing was absolutely current, but neither was it so out-of-date that it seemed like old news. They didn’t just talk about music. Who knew? They had humor and film and politics and all of it seemed to be written for me. I had not fully grasped how much I had been missing. Of course, I hadn’t fully grasped that I was part of a viable demographic, either, but that happened soon enough. I also started to grasp a few things about discernment in choices, whether they were about record purchases or political support. What I most took away from digesting those magazines was the quality of the writing. This was long before the 500 word blog post, but fully in the deep end of the 500 word record review. Yet, whatever the length, whatever the subject, the writer had to care about it. Otherwise, it wasn’t worth publishing. Don’t tell anyone, but I wandered the building at night, poking into closets. The basement turned out to be a torehouse for stuff. In retrospect, it was probably for a thrift sale. I’ll assume that so I don’t feel bad. You can only imagine my joy at finding a box of Rolling Stone‘s. I must have studied the articles, because I still remember details about Neil Diamond and Warren Zevon and Bob Dylan that no brain should store. You’ve Got to Check This Out is a blog series about music, words, and all sorts of artistic matters. It started with an explanation. 126 more to go.